At Home with Chas: Guest Post at Joyous Notions! I'm guest posting over at Joyous Notions! Come on over and check out my latest craft and a yummy pumpkin cream cheese recipe. 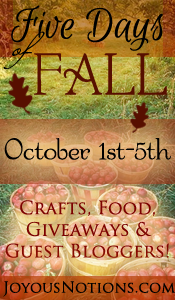 Come on over, there are giveaways, crafts, recipes and more! Thank you Chasity for sharing over at our house! Love your Jute Pumpkin! Cute, cute!